The world of Hindustani culture is an ancient one, but so too is that of the Celts. Since the days of Tacitus, the Highlands and Islands of Scotland have been thought of as ‘The True Edge of the Great World’. When Erik Chisholm composed his piano preludes of that title, it was to signify an exploration of musical geography—a journey into the depths of a tradition which he was especially qualified to undertake. Each of the preludes is based upon a Highland tune, but these are more than settings of traditional melodies. As the word ‘preludes’ implies, they take the form of meditations or improvisations on some aspect of a melody which may only appear in full once in the whole piece. Such was Chisholm’s own excitement with the preludes that the Scottish pianist Agnes Walker described him arriving one Sunday morning at her home on the south side of Glasgow, dressed only in pyjamas and overcoat, and throwing a parcel of music at her father who had opened the door, saying ‘give those to Agnes. I’ve just finished them’ and dashing back to a waiting taxi. Here, for the first time, three of them are recorded in the virtuosic orchestral clothing with which Chisholm dressed them in the same year, 1944. L’univers de la culture hindoustanie est ancien, mais celui des Celtes ne l’est pas moins. Depuis l’époque de Tacite, les Highlands et les îles d’Écosse ont toujours été considérées comme «The True Edge of the Great World» («Les Confins du monde civilisé»). Quand Erik Chisholm composa ses préludes pour piano portant ce titre, c’était pour exprimer une exploration de géographie musicale—un voyage dans les profondeurs d’une tradition qu’il était particulièrement habilité à entreprendre. Chaque prélude repose sur un air des Highlands, mais ce sont davantage des mises en forme de mélodies traditionnelles. Comme le laisse supposer le mot «préludes», ce sont des méditations ou improvisations sur un aspect d’une mélodie qui pouvant n’apparaître en entier qu’une seule fois dans l’ensemble du morceau. Chisholm était tellement excité par les préludes que la pianiste écossaise Agnes Walker raconta son arrivée chez elle un dimanche matin dans le sud de Glasgow, juste vêtu d’un pyjama et d’un pardessus; il lança un paquet de musique à son père qui avait ouvert la porte, en lui disant «donnez les à Agnes. Je viens de les terminer» et il retourna en courant vers un taxi qui l’attendait. Ici, trois d’entre eux sont enregistrés pour la première fois dans la parure orchestrale dont les vêtit Chisholm la même année, 1944. Die Welt der nordindischen Kultur ist uralt. Dasselbe gilt allerdings von jener der Kelten. Seit den Tagen des römischen Historikers Tacitus galten das Hochland und die Inseln Schottlands als „wahrer Rand der großen Welt“. Als Erik Chisholm die Klavierpräludien mit diesem Titel komponierte, wollte er damit anzeigen, dass er hier eine musikalische Geografie erkundete—eine Forschungsreise in die Tiefen einer Tradition, zu der er eine besondere Befähigung mitbrachte. Jedes Präludium beruht auf einer Melodie aus dem Hochland, doch werden dabei nicht einfach Volksmelodien vertont. Wie es das Wort „Präludien“ signalisiert, haben sie die Gestalt von Meditationen oder Improvisationen über einen bestimmten Aspekt einer Melodie, die vielleicht im ganzen Stück nur ein einziges Mal erklingt. Chisholm war selber so begeistert von seinen Präludien, dass er—so berichtet die schottische Pianistin Agnes Walker—eines Sonntagmorgens vor Walkers Haus im Süden Glasgows auftauchte, nur mit einem Schlafanzug und einem Mantel bekleidet; ihr Vater öffnete die Tür, und Chisholm drückte ihm einen Notenstapel in die Hand und sagte: „Geben Sie die Agnes, ich habe sie gerade fertigkomponiert“—dann eilte er zurück zum wartenden Taxi. Für dieses Album wurden sie zum ersten Mal in der virtuosen Orchestrierung eingespielt, die Chisholm im selben Jahr, 1944, anfertigte. Ossianic lay is a rhetorical piece in that its repeated notes suggest incantation—at one point it is marked ‘quasi recitative’. Ossianic lays are rooted in ancient material, and a very few, of which this is one, have survived in the tradition. It was collected by Amy Murray and the words are ascribed to Ossian who recalls heroic days with Oscar, Douglas and Fionn: ‘Latha dhuinn fhìn air Luachar Leobhar’ (‘The day we were at the hillock of rushes’). 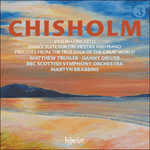 Chisholm treats the melody with simplicity and respect, maintaining a drone and scarcely developing the harmony beyond octave doublings, with just a few chords that colour rather than impel the music. But as the music rises to a climax, we are made aware of its latent and heroic power, with harmonies and textures which are both sombre and magnificent. Chisholm concludes this tantalizing echo of a heroic past with a wonderful peroration and a hushed mystical scattering of notes. Ossianic lay est une pièce rhétorique dans la mesure où ses notes répétées suggèrent une incantation—à un moment, elle est marquée «quasi recitative». Les lais ossianiques sont enracinés dans des matériels anciens et très rares sont ceux, celui-ci en est un, qui ont survécu dans la tradition. Il fut recueilli par Amy Murray et les paroles en sont attribuées à Ossian qui se souvient des jours héroïques avec Oscar, Douglas et Fionn: «Latha dhuinn fhìn air Luachar Leobhar» («Du temps où nous courions dans les collines»). Chisholm traite la mélodie avec simplicité et respect, conservant un bourdon et développant à peine l’harmonie au-delà des doublures à l’octave, avec juste quelques accords qui colorent davantage la musique qu’ils ne la font avancer. Mais lorsque celle-ci s’élève vers un sommet, nous sommes sensibilisés à son pouvoir latent et héroïque, avec des harmonies et des textures à la fois sombres et magnifiques. Chisholm conclut cet écho attrayant d’un passé héroïque par une merveilleuse péroraison et une constellation mystique feutrée de notes. Das Ossianic lay („Ossianische Ballade“) ist insofern ein rhetorisch geprägtes Stück, als seine Tonwiederholungen Sprechgesang nahelegen; an einer Stelle sind sie „quasi recitative“ bezeichnet. Ossianische Balladen wurzeln in sehr altem Material, und nur wenige sind überliefert; diese ist eine davon. Notiert wurde sie von Amy Murray, und der Text wird Ossian zugeschrieben, der von den Zeiten der Helden Oscar, Douglas und Fionn erzählt: „Latha dhuinn fhìn air Luachar Leobhar” („Der Tag, als wir am Binsenhügel waren”). Chisholm behandelt die Melodie mit Schlichtheit und Zurückhaltung, unterlegt ihr einen Bordun und geht in der Harmonik kaum über Oktavverdopplungen hinaus; einige wenige Akkorde färben die Melodie eher, als dass sie sie vorantreiben. Wenn die Musik sich jedoch auf ihren Höhepunkt erhebt, wird dem Hörer bewusst, welche heroische Kraft in ihr steckt; Harmonik und Satztechnik wirken ernst und zugleich grandios. Diese verführerische Beschwörung einer heldenhaften Vergangenheit beschließt Chisholm mit einem berückenden Epilog und mystisch versprengten Einzeltönen. Port a beul literally means ‘mouth music’ and refers to the continuing practice of singing dance music, often using nonsensical words and tongue-twisters to emphasize the rhythmic drive of the music. On no account may the rhythm be broken for the intake of breath, which has to be managed by subtle omission of a note or two. Port a beul is often danced to, but is also sung simply for the fun of it. Chisholm’s piece is in the form of a reel and enjoys the same breathless and almost relentless drive, the test of stamina being also part of the fun. This one is a wooing song. It is occasionally necessary to remind people that there is joy as well as sorrow in Highland music and if ever there were music to set the record straight, this is it. Port a beul signifie littéralement «musique de bouche» et fait référence à la pratique permanente consistant à chanter la musique de danse, en utilisant souvent des paroles dénuées de sens et des phrases très difficiles à prononcer pour souligner l’énergie rythmique de la musique. En aucun cas le rythme ne peut être rompu pour reprendre son souffle, ce qui doit se faire par l’omission subtile d’une ou deux notes. On danse souvent sur Port a beul, mais on le chante aussi juste pour le plaisir. L’œuvre de Chisholm a la forme d’un «reel» (quadrille écossais) et jouit de la même énergie à couper le souffle et presque implacable, le test d’endurance faisant aussi partie du jeu. C’est un chant séduisant. Il est parfois nécessaire de rappeler qu’il y a de la joie comme du chagrin dans la musique des Highlands et s’il y eut jamais une musique pour remettre les pendules à l’heure, c’est bien celle-ci. Port a beul bedeutet wörtlich „Mund-Musik“; der Ausdruck bezieht sich auf die noch heute lebendige Praxis, Tanzmusik zu singen, häufig auf Nonsens-Silben oder Zungenbrecher, die den Rhythmus der Musik betonen. Um keinen Preis darf der Rhythmus zum Atemholen unterbrochen werden; stattdessen muss man dazu geschickt eine oder zwei Noten auslassen. Häufig wird zum Port a beul getanzt, oft aber wird er einfach zum Vergnügen gesungen. Chisholms Stück ist als schottisches Reel komponiert und von atemloser, ja unerbittlicher Bewegung geprägt, eine Herausforderung ans Durchhaltevermögen, die hier dazugehört. In diesem Lied wird um eine Geliebte geworben. Manchmal muss man daran erinnern, dass Freude in der Musik des schottischen Hochlands ebenso ihren Platz hat wie Leid—bedürfte es eines Beweises, so wäre er mit diesem Stück erbracht. The Song of the mavis (Oran na Smeoraich) imitates the thrush and is well known in Gaelic tradition as a children’s song describing the parent bird calling its young to dinner with characteristic repetitions. The true original is very simple and only roughly pitched. It is not a song. Chisholm’s version has its source in a more elaborate version from Amy Murray’s Father Allan’s Island, and he has allowed fancy to carry him away, turning this homely piece into an idyllic ripple of bird-song, spring burgeoning with assertive joy. Le Song of the mavis (Oran na Smeoraich) imitant la grive, est célèbre dans la tradition gaélique comme une chanson d’enfants décrivant l’oiseau géniteur qui appelle son petit à dîner avec des répétitions caractéristiques. Le véritable original est très simple et dans une tonalité approximative. Ce n’est pas une chanson. La version de Chisholm prend sa source dans une version plus élaborée de Father Allan’s Island d’Amy Murray. Il a laissé son imagination l’emporter, transformant cette pièce simple en un gazouillement idyllique de chant d’oiseau, le printemps bourgeonnant avec une joie affirmée. Der Song of the mavis (Oran na Smeoraich) ahmt den Ruf der Drossel nach und ist in der gälischen Tradition als Kinderlied bekannt, das schildert, wie die Drosselmutter ihre Kinder mit typischen Wiederholungen zum Essen ruft. Die Originalmelodie ist sehr einfach und hat nur ungefähre Tonhöhen; es handelt es sich nicht um ein Lied im eigentlichen Sinn. Die Fassung Chisholms geht auf eine ausführlichere Version aus Father Allan’s Island von Amy Murray zurück. Er lässt seiner Fantasie freien Lauf und verwandelt das Stück in idyllischen, sacht bewegten Vogelgesang, während der Frühling sich nach und nach freudig behauptet.